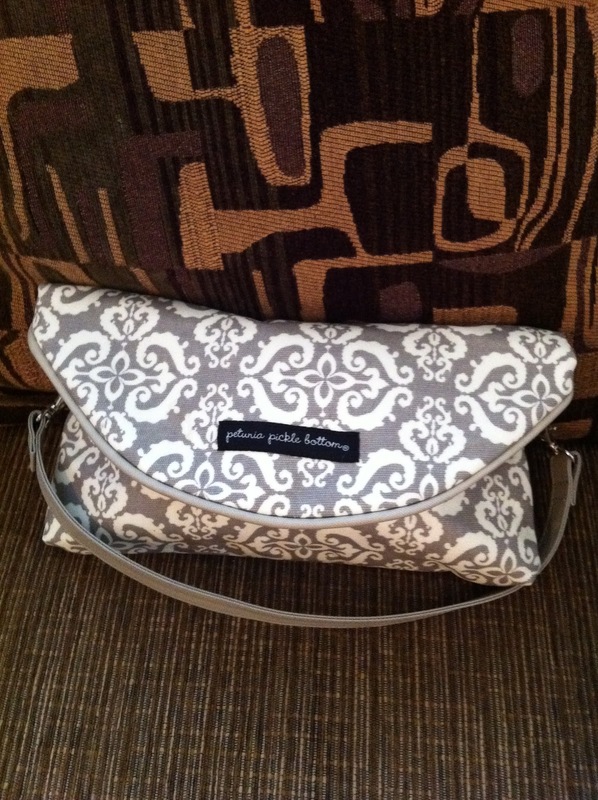 Cottage on Blackbird Lane: Diaper bag returns! This is the diaper bag that duped some punk kids in our neighborhood. It is safely back in our home being used to tote daipers for little Adelynn. 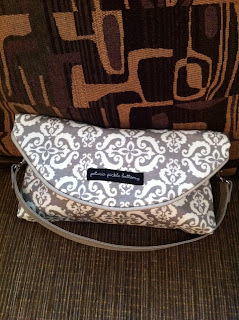 This Petunia Pickle Bottom clutch diaper bag has been my favorite grab and go bag. It is the perfect size to take into the grocery store or stuff under the umbrella stroller. The compact size was the reason I bought it, well, that and it was on sale! Sale! Before it was "misplaced" I just kept it in the van so I'd always have a stash of diapers on hand. In hindsight that was not such a great idea. I should have made a better effort to keep the diaper bag tucked under the seat or some other out of sight location. Alas the life of a busy mother. About that "misplaced" part. The week this diaper bag went missing I noticed its absence on Thursday evening. I knew it was in the van on Tuesday morning and night since I used it for Adelynn's music class and during Olivia's soccer practice. I didn't drive the car on Wednesday so it may have been there or not. I noticed it was gone on Thursday night during Olivia's soccer practice when I wanted to take it along to the soccer field. That's when I knew something was a little odd because the diaper bag AND my pink coupon file folder was missing. Keith just thought I misplaced the diaper bag some where in the house. I knew differently. It's one thing to misplace a diaper bag, but a diaper bag and a coupon folder? Now that is strange. Too strange for me. For a few days I was starting to think I was a little crazy. Maybe I left the diaper bag and coupon folder in a shopping cart at the supermarket. There for a moment that seemed to be the only reasonable answer. I would have gone on thinking that was the answer if I had not remembered that I didn't use my coupon book that Monday. I knew I didn't use it because I had left all my coupons on the counter at home, so I didn't even need the coupon book that week. After I checked the house and garage to confirm it was not lurking in some corner under a pile of junk I knew the bags had to have been swiped. There have been some neighbor kids cutting through our yard these past few weeks. I would not be surprised if one of them decided to seek some easy cash. I just assumed that it was some of those kids. A year or two ago several of our neighbors had their cars broken into for random things like hunting gear and cds. Considering the timing of our missing diaper bag was before Halloween it just seemed like a rerun of a few years ago. My suspicion was confirmed when Olivia found the diaper bag and coupon book. She was out playing around with some friends when she noticed the diaper bag and its contents scattered in the woods by her friend's house. Diapers and coupons were all over. A few days of drying out and the diaper bag was back in use. Sadly my coupon book needed almost a week to dry out properly. The coupons were lost and that was a big bummer. At first I was upset with the punks who took the diaper bag and coupon book. Once I thought about it I couldn't help but laugh. All I have to do is imagine the faces of the persons who took our things. Oh they must have been so proud to score something so easily. 2 handbags! Right there in a van in plain sight. Oh what luck. Except that luck was to run out quickly. Once they opened that PPB clutch thinking it was a cute looking purse only to discover DIAPERS! Even after carefully searching every inch of that bag to find nothing but diapers, wipes and diaper cream. Oh yes, the failure was evident. I can't even imagine what they were thinking the coupon folder was. That must have been a real bummer opening up that one. Pockets and pockets of coupons. The confusion and disappointment would have been quite embarassing. Sure the thieves took my things and tossed them into the woods but I get the last laugh knowing that only amatuers would swipe a diaper bag and coupon folder. I'm just glad my diaper bag is back because I really like that PPB clutch. Now, about my coupons, I'm still peeved about that big loss. I had some good coupons in there. Silly thieves. Maybe they should just stick to swiping cash from Mom and Dad's pocketbooks.....oh wait who carries cash these days? I have a better idea why don't they get a job like I did when I wanted some spending money. Sounds like a great idea for some punks with a lot of time on their hands to be scouting out neighborhood cars to break into. Just a thought.